American men are not shaving with old-fashioned razors like they used to. More men are growing full beards, goatees, or stubble, while others who once shaved every day before work feel comfortable occasionally skipping out as taboo around facial hair at the office fades, consumer research experts say. The "continued societal shift to fewer shaves" has offset some of the adjustments Gillette's parent company Procter & Gamble (PG) made to strengthen its sales, Jon Moeller, P&G's chief financial officer, told reporters last week. P&G believes it's easier for men today to avoid a shave during the work week or on a casual weekend. "Today, men are not judged negatively when they skip a shave — it is not considered lazy or disrespectful," Massimiliano Menozzi, the vice president of Gillette North America, said in an email. Shaving attitudes differ by age group, but men under 45 have taken a more relaxed approach, said Olivia Guinaugh, a home and personal care analyst at market research firm Mintel. Guys increasingly want to portray a "laid-back look," and many believe facial hair is popular, authentic, and attractive. In developed markets, the average number of times men shave a week has fallen from 3.7 to 3.2 over the past decade, totaling about two fewer shaves a month, Gillette estimated based on its latest consumer studies. 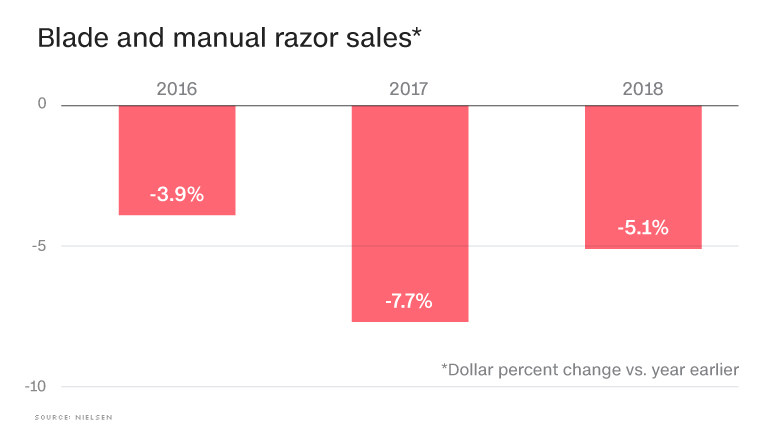 Although the slowdown seems trivial, manual razor and blade sales in the United States slipped each of the past three years, according to Nielsen brick-and-mortar retail scanner data. 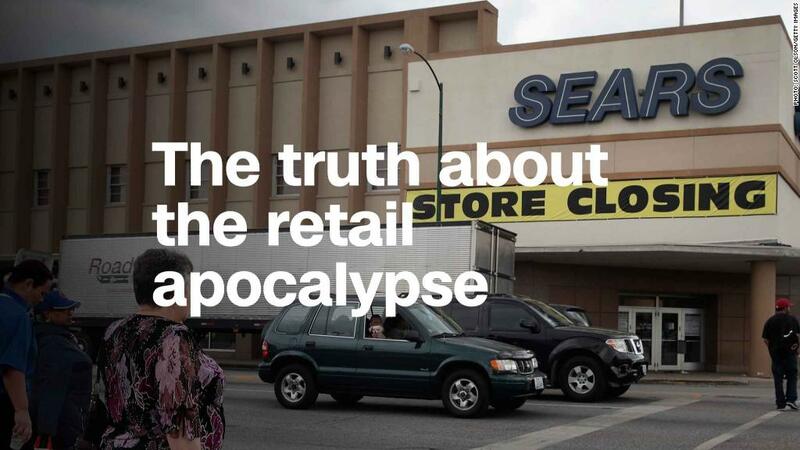 From June to 2018, sales fell 5.1% compared to the same point the year prior. The decline has weighed on large players like P&G, BIC, and Edgewell Personal Care (EPC), the owner of Schick and Wilkinson Sword. Edgewell gets 60% of sales from its wet shave division. The company's CEO told analysts Tuesday that "the more relaxed culture" has led to fewer shaves in the United States. P&G, the world's biggest shaving player, has shifted tactics in its grooming business in recent years. The unit, which includes Gillette, Braun and Venus razors, blades, and shaving products, accounted for 10% of the company's $66.8 billion in sales last year. Shaving is a high-margin category for P&G, driven by customers re-upping on blade cartridges. The consumer products conglomerate bought Gillette in 2005 for $57 billion, then the largest acquisition in its history. Warren Buffett, Gillette's largest shareholder at the time, called it a "dream deal." The merger has not always panned out as P&G hoped. P&G's US market share for men's razors and blades dropped more than 13 percentage points from 2012 to 2017, according to Euromonitor data cited by Stifel. Gillette's sales in this country fell 24% during the same span. In its annual filing, P&G warned it was closer to writing down the costs of its grooming business than its other units in part due to the shaving slowdown. Gillette's struggles have extended beyond a market downturn. Critics, including activist investor Nelson Peltz, who won a seat on P&G's board after a lengthy proxy fight, hammered executives for underestimating cheaper, direct-to-consumer online subscription shaving clubs, including Dollar Shave Club and Harry's. Gillette staged what it called an "intervention" last year, cutting prices by an average of 12%. Gillette also expanded cheaper choices, introducing disposable razors with cooling technology and three- and five-blade razors for under $10. "Taking the pricing down and realizing they had too much of a premium was a strong step," said Stifel analyst Mark Astrachan. The moves helped Gillette regain share and reverse sales declines. In addition, Gillette on Demand, a relaunched digital subscription platform that includes text-to-order and free shipping, has given the company a new tool to acquire customers online and fight off Dollar Shave Club and Harry's. Executives have said they expect competition among razor players to remain steep. Dollar Shave Club has expanded its brick-and-mortar presence since Unilever acquired the company two years ago. Harry's started selling razors at Walmart. And Kroger and Costco both recently launched their own private label shaving collections: Bromley's for Men and Kirkland Signature. P&G's shaving business is not staking its future entirely on razors, though. The company has adapted to changes, broadening choices for men sporting stubble, beards, mustaches, goatees, and soul patches. "No one else is better positioned to compete in this space," said Gillette's Menozzi. "In the past year, we've been much more deliberate about reminding men about the wide range of high quality tools we have to meet their needs." Within the fast-growing styling and grooming segments of the market, Gillette has introduced popular sellers, including the all-purpose Fusion ProGlide Styler, as well as Braun beard trimmers. The company's trimmer sales grew 4.2% from mid-July 2017 to 2018, according to Nielsen data cited by Wells Fargo. P&G's 2009 acquisition of The Art of Shaving, a premium brand of shaving kits and accessories with more than 100 brick-and-mortar locations, has also helped the company enter the beard balms, oils, and fragrance categories. The Art of Shaving has experts who offer styling tips and advice. "The Art of Shaving business is a unique advantage for us," Menozzi said. "Our barbers are on the front lines of male grooming trends."